Welcome Friends! Today’s guest post was contributed by Shametria Routt Banks, The Routty Math Teacher, and is about implementing number talks in the classroom. 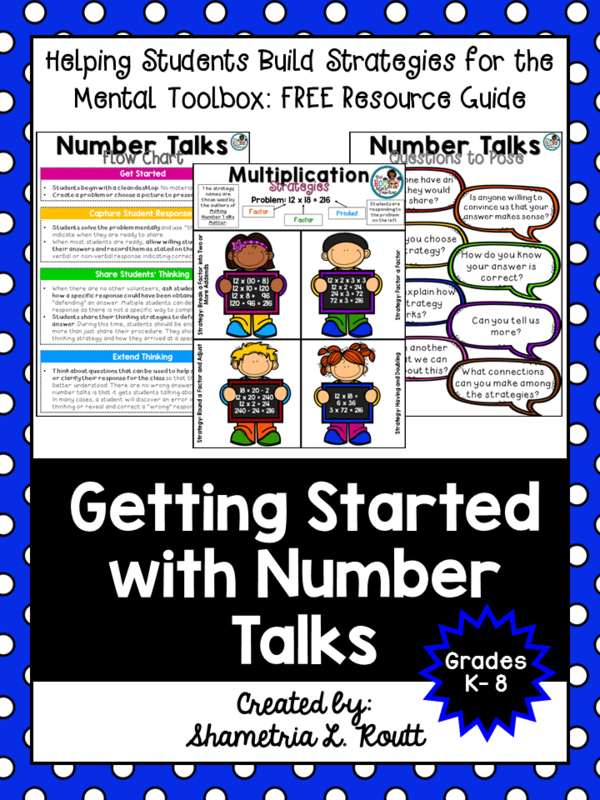 This post includes an overview of how and why number talks work, tips and strategies to get you started, as well as a variety of resources to use on your journey. Happy reading! Some years ago, I had a student named David. Because I looped with my fourth grade class up to fifth grade, I was teaching David for a second year. Just to give you a little background about David, he came to me in fourth grade as one of my lowest performers. In fact, he had failed the state assessment the previous year in third grade. Needless to say, David struggled through the year. However, by the end of the year, he had made a tremendous amount of progress and only missed five questions (out of about 50) on the state test. Given his success and relentless desire to succeed, I was thrilled to have another year with David! After this exchange, and sensing both my and the student’s frustration, David walked over to the student and said, “This is what she means.” He proceeded to show his new classmate how to break the 24 into 20 and 4 and then multiply each part by 8 to get 160 + 32 = 192. I couldn’t believe my eyes! David was teaching one of the highest achieving students in the class how to multiply using a mental math strategy. At that moment, David was the student with the knowledge who knew how to do the math! I was so proud! This illustration includes a list of guiding principles to support teachers as they begin using number talks with students in the classroom. This moment in teaching reminded me that our students will learn what we teach them if we give them the right tools to learn. I didn’t realize it at the time, but I know now that a simple routine that I had been doing with my fourth graders to help them gain some mental math and numeracy skills had given them a new toolbox of strategies with which to attack math problems. Back then, I called them “mental math strategies,” and we worked through one problem each day sharing strategies and discussing ideas. Today, this same activity has been coined a Number Talk. Last fall I participated in a nationwide collaborative book study with teachers and instructional leaders across the country focused on the book Making Number Talks Matter by Cathy Humphreys and Ruth Parker. Each week, we discussed a new chapter via a Teaching Channel forum, Twitter, or Facebook group. 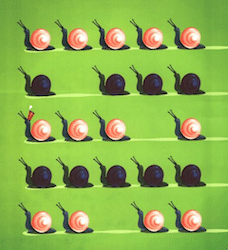 As I reflected on my learning, I decided to write this article to introduce other teachers to number talks and to help them get started using the routine in their classroom from the very first days of school. What Is a Number Talk? A number talk is a daily routine that requires students to demonstrate flexibility in working with numbers and solving basic problems without using paper and pencil to find the solution. Hold on, upper grades teachers! Before you stop reading this article, consider how number talk routines can be used to help your students think more flexibly about whole numbers and operations with fractions and decimals. What’s the Value in Doing Number Talks? Besides building more confident math students, number talks require students to be flexible in their thinking about numbers and operations. 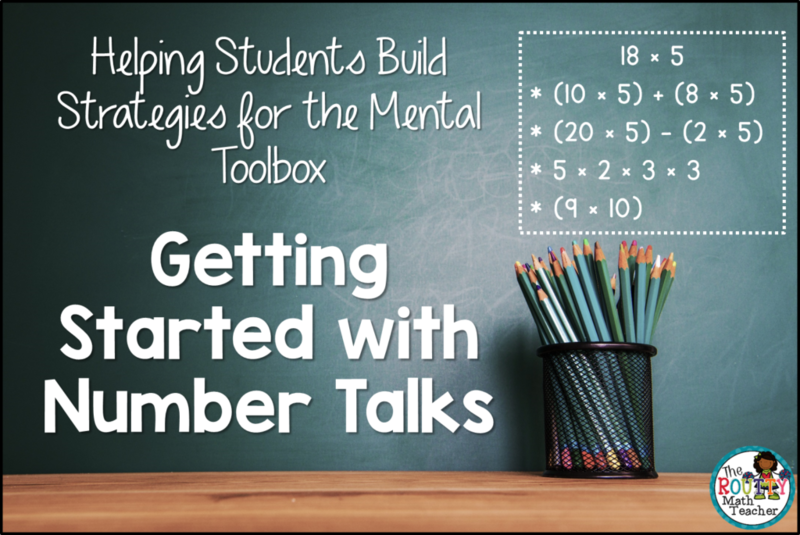 In addition, students increase their ability to articulate their thinking and refine their mathematical communication skills through the use of number talks. The authors spend a good portion of the book demonstrating how number talks can be used to help students “think deeply and flexibly about the operation[s]” (p. 33). Where a teacher decides to start with his or her students depends on several factors. When I began using a number talk-like activity in fourth grade, I started with multiplication because we were working on strategies for multiplication on our pace chart for the yearly scope and sequence. Through this experience, I was able to provide a very rich opportunity to extend my students’ thinking to more advanced numerical equations, such as (2 x 5) + (3 x 4) = 22 or (5 x 5) – 3 = 22, and form the basis for understanding the order of operations. This activity then provided a good foundation for the work we were doing with multi-digit multiplication. The authors stress the importance of teachers being familiar with a variety of strategies before beginning number talks. This allows two things to happen. First, it allows teachers to be able to help students articulate a strategy they’ve used by asking questions that will help them analyze and then communicate about their method more clearly. Second, it allows teachers the opportunity to suggest a particular strategy if it does not come up in conversation. Adding, “I once had a student who completed the strategy like this _________” is a good way to interject a strategy you want to explore with the class. 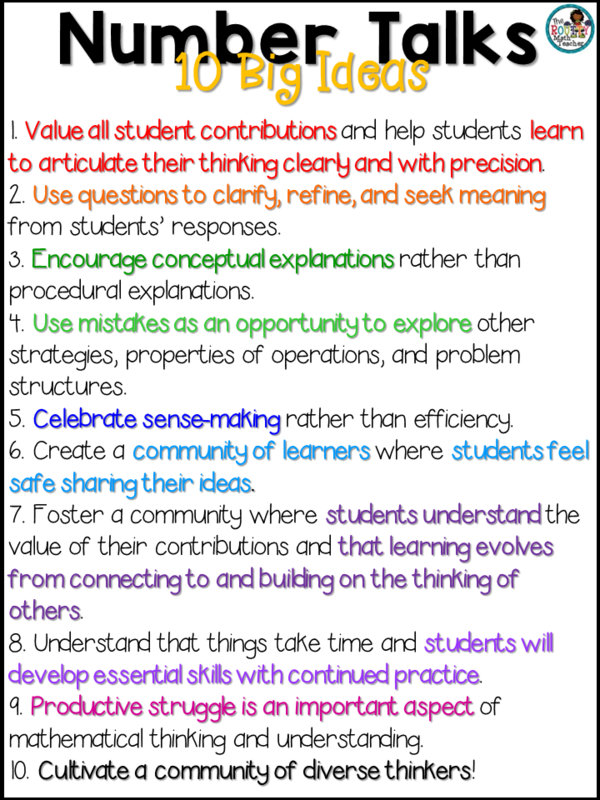 Ultimately, this will lead to all students expanding their strategy toolboxes. This illustration shows a sample strategy poster. 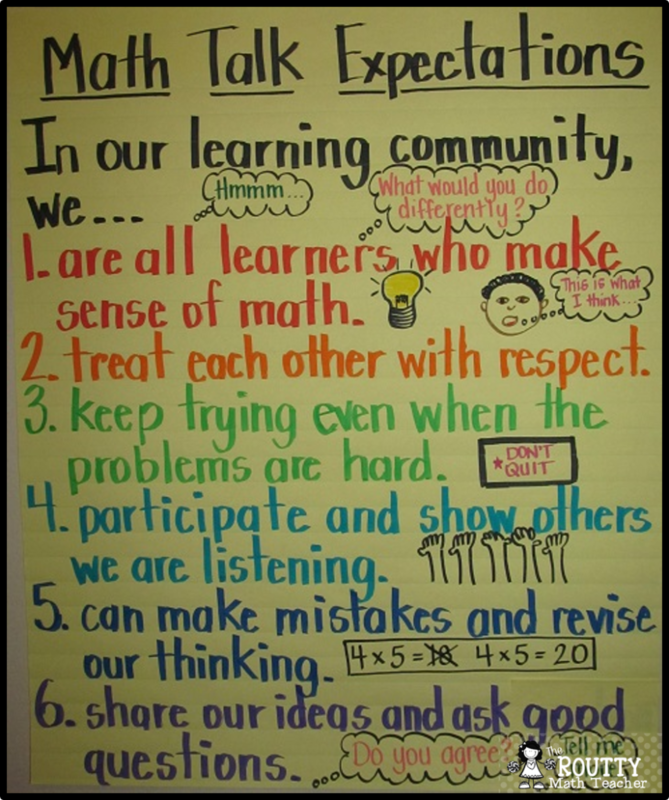 This Math Talk poster shows an example of the norms that can be used to build a Number Talks community in your classroom. Unlike a math talk, during a number talk, it is the teacher’s job to encourage students to share their solution strategies, ask questions to clarify understanding, and direct the learning of the class. Number talks require students to explain their solution strategies, convince others that their strategy works, and listen to and pose questions about the strategies of others. The flow of the Number Talk is described in detail below. Have students begin with a clean desktop, as no materials are needed. Create a problem, or choose a picture to present. Ask students to solve the problem mentally and use a “thumbs-up” to indicate when they are ready to share. When most students are ready, allow willing students to share their answers, and record them as stated on the board without a verbal or non-verbal response indicating correctness. When there are no other volunteers, ask students to explain how a specific response could have been obtained; this is called “defending” an answer. Multiple students can defend the same response, as there is not a specific way to complete a problem. Have students share their thinking strategies to defend a specific answer. During this time, students should be encouraged to do more than just share their procedure. They should share their thinking strategy and how they arrived at a specific response. While students are defending, think about questions that can be used to help students extend or clarify their response for the class so that their strategy is better understood. There are no wrong answers! The beauty of a number talk is that it gets the students talking about their thinking. In many cases a student will discover an error in their own thinking or reveal and correct a “wrong” response on their own. You can learn more about the number talk process and see a number talk in action using the video links in the video resources section at the end of this article. Because the goal of number talks is to help students communicate their thinking, after a student has shared his/her strategy, there are several questions that can be used to extend and help a student better shape his/her thinking. Are there any questions for ________________? Can you tell me more about ________________? Can someone use their own words to explain ________________’s strategy? Is there another way that we can think about this? What connections can you make among the strategies? 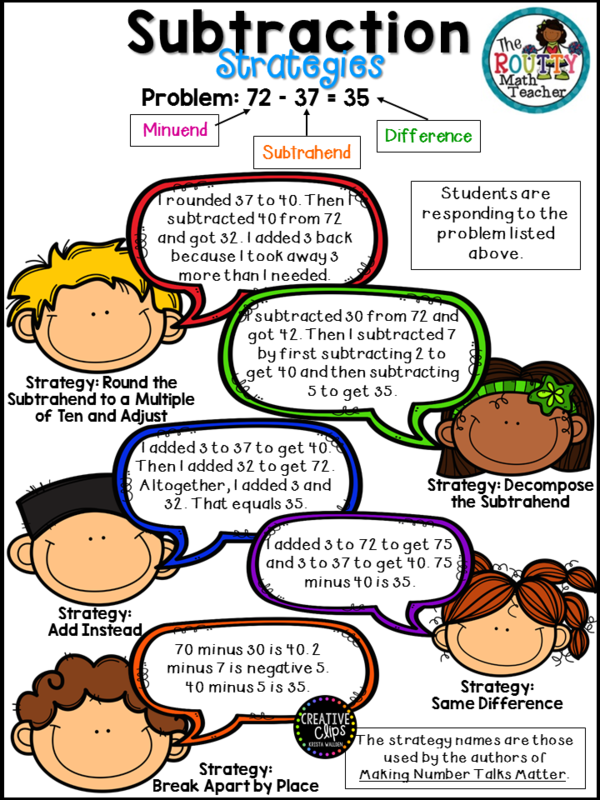 The strategies that students use and are able to learn from doing number talks is invaluable! Students can build a mental storehouse of strategic tools through this process. Tools = POWER — when our students possess and can select tools strategically to solve problems. In addition, the rich discussion that occurs between the students and the teacher during number talks is truly amazing! Imagine the possibilities if all of our students had the reasoning, critical thinking, language, and communication skills that result from regular participation in number talks. Freebie Alert! I have created a “Getting Started with Number Talks” pack full of resources to help you get started on your number talks journey. Grab this freebie here or click on the image. “Dot Talks: Building Fluency with Numbers” is a Teaching Channel video of a first grade number talk in action with a group that has a large number of English Language Learners. “How to Learn Math for Teachers and Parents” with Jo Boaler gives you a feel for the power behind number talks. Rather than being an example of a number talk in action in a classroom, this video gives a few examples of how number talks can be used to build math power and provides a bit more background behind their usefulness. Pinterest Board: There are many great resources for all grade levels on Pinterest. Click here to check out my Number Talks Pinterest board. Tang, G. (2001). The Grapes of Math. 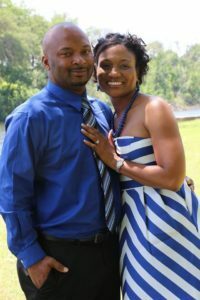 New York, NY: Scholastic, Inc.
Shametria is married to an amazing basketball coach and has been a Texas educator for 14 years. She’s currently a secondary math instructional coach and is working toward a Doctoral degree in Mathematics Education at Baylor University. She is also a blogger, instructional resource creator, and professional development facilitator! Check out her Routty Math Teacher Blog and Teachers Pay Teachers Store for additional teaching tidbits and freebies! What type of pre-assessment and post-assessment do you use to determine student academic growth? Great question Carol! In terms of a pre-assessment, I think you would use informal assessment data based on your observations about areas where your students demonstrate an inability to think flexibly about numbers. In terms of a post-assessment, you can certainly use a paper-and-pencil task to have students respond to a set of tasks that will allow them to demonstrate their use of mental math strategies; however, you may also use informal assessments to glean a better understanding of how students are internalizing what they learn from the number talks. Alternatively, you can also see a post-assessment idea in action here: https://www.teachingchannel.org/video/number-talks-for-assessments. I hope this helps!